In his State of the Union address, the President laid out his vision for America to win the future. The President made it clear that the most important contest we face today is not between Democrats and Republicans, but rather America’s contest with competitors across the globe for the jobs and industries of the future. To win that contest and secure prosperity for Hispanics and all Americans, we have to out-innovate, out-educate and out-build the rest of the world. The Hispanic community plays an integral part of that plan to win the future. 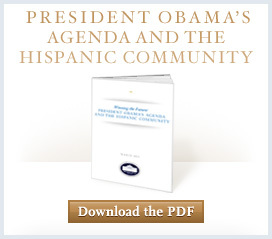 Since taking office, every issue the Obama Administration has addressed has been of vital importance to the Hispanic community, from promoting job creation to making sure that every American has access to quality health care, to reforms that strengthen education for all Americans, to fighting for comprehensive immigration reform while standing up for the civil rights of all Americans. This is your one-stop shop for what the Obama Administration is doing related to the Hispanic community and is a place where you can see the work of some of the Hispanic appointees across the Obama Administration.